Sterling Silver Swarovski Crystal & Eye Beads Bracelet (Size & colors vary) These are 6mm beads not the over sized large 8-10mm, these are 6mm and stylish, not gaudy. The genuine Swarovski roundels shine brilliantly. The picture does not do it justice. This is not Red and not tied around Rachel's Tomb. How does it work? It has painted eyes, a symbol of good luck famed to ward off the evil eye by connecting with the energy of compassion. Use it with the awareness of Rachel, the compassionate Mother. This stretch bracelet features glass colored beads linked by sterling silver & Swarovski crystal roundels. 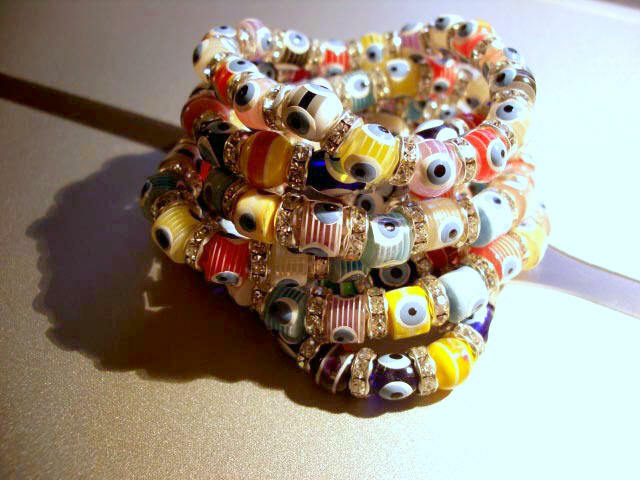 Each bead glows with decorative painting and a "Protective Eye". Revised: 14 Dec 2014 00:29:04 -0500 .